Franz Leopold Graff was born on 16 October 1719 in Ruppersthal, in the same house which would later witness the birth of Ignaz J. Pleyel. He died 16 March 1779 in the Benedictine Monastery of Göttweig. Franz Leopold Graff was a scion of the Ruppersthal Graff family of teachers. According to the Ruppersthal church register his father Andreas Graff (also written Graf) was schoolteacher in Ruppersthal until 1742. He was succeeded by his eldest son Johann Michael, who married the later mother of I.J. Pleyel, Anna Theresia Forster on 9 January 1742. Michael Graf(f) died on 4 February 1744 after two years of marriage as a 35-year old. The widow and teacher Anna Theresia Forster was married to Martin Pleyl of Bad Pyrawarth, who had been trained in the Maissau teacher�s academy, on 28 April 1744. Anna Theresia bore Martin Pleyl eight children, four of which survived infancy. The youngest surviving child was named Ignatius Josephus Pleyl (later Pleyel). According to the book of vows of Göttweig Monastery (published by Abbot Dr. Clemens Lashofer) Franz Leopold Graff was active in the Benedictine Monastery from 1744 until 1779 as a principal teacher. From the Göttweig parish registry we know that Graff was "musician and schoolmaster here" (that is in Göttweig Monastery). Franz L. Graff provided the only extant manuscript of Joseph Haydn�s "Roratenmesse", which had been lost and was only rediscovered in 1957. He wrote at least 10 masses (among them the St. Ruperti-Messe, presumably in honour of Ruppersthal or at least in that of the presumed founder of Ruppersthal, St. Rupert). The Ruppersthal composer also created 14 requiems, and nearly 100 sacred works. 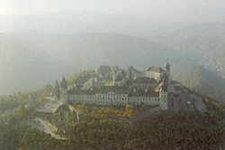 A large number of works are documented in the archives of Göttweig Monastery, whose Custodian is Prof. Dr. F. Riedel. Along with Johann Georg Zechner (1717 � 1778), Franz L. Graff is considered to be a talented composer whose works mirror the change in style from Baroque to Classical during the era of Maria Theresia. The composer, schoolmaster, and musician lived in a teacher�s flat in the Göttweig Monastery. Unfortunately no image of Franz Leopold Graff exists within the Benedictine Monastery of Göttweig. In those days it was usual only to make portraits of important persons, such as the Abbot. It was only in the Biedermeier days that identifiable portraits of less important people begin to be found.